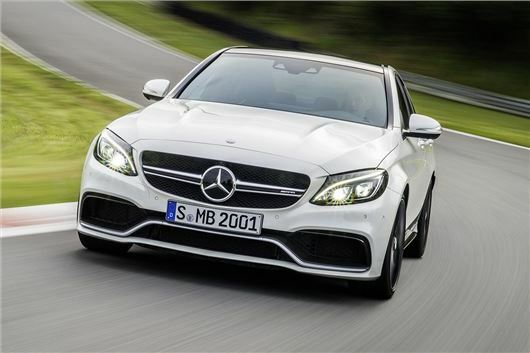 The base price for a new Mercedes-Benz C 63 AMG will be £59,795. The latest generation of Mercedes-Benz’s smallest super saloon hits the UK in Spring 2015, with four-door and Estate versions on the way, as usual, and each will be powered by an all-new 4.0-litre twin-turbo V8 engine. Two power outputs are available, in both Saloon and Estate body styles: 476PS and 510PS, the latter badged ‘S’. So, the sub-£60k starting price of a standard C 63 AMG Saloon is bookended by the £67,745 RRP of the C 63 AMG S Estate. Peculiarly, the stock C 63 AMG Saloon has exactly the same 4.1-second 0-62 sprint time as the 34PS more powerful C 63 AMG S Estate. The slowest version is the standard Estate (4.2 seconds), while the quickest S Saloon can reach the benchmark in four seconds flat. All of them are electronically limited to 155mph, and their official combined fuel economy ratings are 34.5mpg for both Saloons and 33.6mpg for the two Estates – that’s homologation for you. With these cars being the pinnacle of the C-Class range, their equipment lists read like a what’s what of fast car stuff: AMG sports seats in Nappa leather with electric adjustment and memory function, mechanical locking rear differential, dynamic engine mounts, big AMG brakes, four tailpipes, widened front and rear tracks, a rear spoiler, 18-inch alloy wheels, and adjustable gearbox, suspension and engine management settings. The S models get an extra inch on the rims, and even bigger brakes including calipers painted red. The options list includes a head-up display, a sound actuator to make the exhaust even louder in the cabin, carbon-ceramic brakes and the ever-so-fashionable full-LED headlights. That includes 19-inch alloy wheels with a red stripe painted around the circumference, AMG graphics for the bodywork, black exterior trim in place of the standard aluminium, and a contrasting black spoiler. Inside, red stitched leather is swathed across the door panels and dashboard, the centre console stack is fashioned from red carbon fibre. Plue, the hitherto optional Burmeister stereo is thrown in gratis. The asking price for an Edition 1 is £73,500 for the Saloon, or £74,700 for the Estate. It too hits the road in Spring 2015.